* बरिष्ठ फुटबल क्लबमा उपस्थिति तथा खेल्दा गरेको गोल (गोललाई घरेलु लिगमा गरेको गनिनेछ) नवीनतम जानकारी 22:03, 16 मार्च 2016 (UTC). मेस्सी ने 16 नवम्बर 2003 को (16 वर्ष और 145 दिन की उम्र में) पोर्टो के खिलाफ़ एक दोस्ताना मैच में फ़र्स्ट टीम के लिए अपने खेल-जीवन की अनधिकृत शुरूआत की।  बाद में, एक साल से भी कम समय में, फ़्रैंक रिजकार्ड ने उन्हें 16 अक्टूबर 2004 को (17 वर्ष और 114 दिन की उम्र में) एस्पैनयॉल के खिलाफ़ अपने लीग खेल की शुरूआत का मौक़ा दिया और वे बार्सिलोना के लिए खेलने वाले तब तक के तीसरे सबसे कम उम्र के खिलाड़ी और ला लिगा में खेलने वाले सबसे युवा क्लब के खिलाड़ी बने (जो रिकॉर्ड सितंबर, 2007 को टीम के साथी बोयान क्रिच ने तोड़ा). जब उन्होंने 1 मई 2005 को अल्बासेटे के खिलाफ़ क्लब के लिए अपना पहला सीनियर गोल किया, मेस्सी 17 वर्ष, 10 महीने और 7 दिन की उम्र के थे और तब तक बार्सिलोना के लिए ला लिगा खेल में स्कोर करने वाले सबसे कम उम्र के खिलाड़ी बने जिस रिकॉर्ड को 2007 में मेस्सी के असिस्ट से बोयान क्रिच ने तोड़ा. मेस्सी ने अपने पूर्व कोच फ़्रैंक रिजकार्ड के बारे में कहा: "मैं कभी नहीं भूल सकता कि रिजकार्ड ने मुझे खेल में प्रवेश कराया. उन्होंने ही मुझमें विश्वास जगाया, जब मैं केवल सोलह, सत्रह साल का था।"
"Messi I think is like me, he is the best in the world along with Ronaldinho." जून 2004 में, पारागुए के खिलाफ़ अंडर-20 दोस्ताना मैच में उन्होंने अर्जेंटीना के लिए शुरूआत की. 2005 में वे नीदरलैंड में 2005 FIFA वर्ल्ड यूथ चैम्पियनशिप जीतने वाली टीम का हिस्सा थे। वहां, उन्होंने गोल्डन बॉल और गोल्डन शू जीता. फ़ुटबॉल में उनके दो चचेरे भाई हैं, मैक्सी और इमैन्युअल बियानकुची. ↑ अ आ इ "Lionel Andrés Messi". fcbarcelona.com. अभिगमन तिथि 2008-05-03. ↑ "Lionel Andrés Messi at Soccerway". Soccerway. अभिगमन तिथि 2009-06-14. ↑ Broadbent, Rick (2006-02-24). "Messi could be focal point for new generation". Times Online. अभिगमन तिथि 2009-03-31. ↑ Gordon, Phil (2008-07-28). "Lionel Messi proves a class apart". Times Online. अभिगमन तिथि 2009-03-31. ↑ Williams, Richard (2008-04-24). "Messi's dazzling footwork leaves an indelible mark". द गार्डियन. अभिगमन तिथि 2009-03-31. ↑ "European Footballer of the Year ("Ballon d'Or")". RSSSF. अभिगमन तिथि 2009-07-07. ↑ अ आ "FIFA World Player Gala 2008" (PDF). FIFA. अभिगमन तिथि 2009-07-07. ↑ "FIFA World Player Gala 2007" (PDF). FIFA. अभिगमन तिथि 2009-07-07. ↑ Gardner, Neil (2007-04-19). "Is Messi the new Maradona?". Times Online. अभिगमन तिथि 2009-03-31. ↑ Reuters (2006-02-25). "Maradona proclaims Messi as his successor". China Daily. अभिगमन तिथि 2006-10-08. ↑ Veiga, Gustavo. "Los intereses de Messi" (स्पेनी में). Página/12. अभिगमन तिथि 2009-05-31. ↑ अ आ इ Hawkey, Ian (2008-04-20). "Lionel Messi on a mission". Times Online. अभिगमन तिथि 2009-05-30. ↑ Aguilar, Alexander (2006-02-24). "El origen de los Messi está en Italia" (स्पेनी में). Al Día. अभिगमन तिथि 2009-07-07. ↑ Cubero, Cristina (2005-10-07). "Las raíces italianas de Leo Messi" (स्पेनी में). El Mundo Deportivo. अभिगमन तिथि 2009-07-07. ↑ "Lionel Messi bio". NBC. अभिगमन तिथि 2009-05-30. ↑ अ आ इ ई Williams, Richard (2006-02-26). "Messi has all the qualities to take world by storm". द गार्डियन. अभिगमन तिथि 2008-05-03. ↑ White, Duncan (2009-04-04). "Franck Ribery the man to challenge Lionel Messi and Barcelona". Daily Telegraph. अभिगमन तिथि 2009-07-07. ↑ अ आ "The new messiah". FIFA. 2006-03-05. अभिगमन तिथि 2006-07-25. ↑ अ आ इ "Lionel Andres Messi - FCBarcelona and Argentina". Football Database. अभिगमन तिथि 2006-08-23. ↑ "Meteoric rise in three years". fcbarcelona.com. अभिगमन तिथि 2008-05-03. ↑ Nogueras, Sergi (2007-10-21). "Krkic enters the record books". fcbarcelona.cat. अभिगमन तिथि 2009-07-16. ↑ "Messi: "Rijkaard gave us more freedom"". Goal.com. 2007-12-10. अभिगमन तिथि 2009-12-10. ↑ Bartram, Steve (2005-08-31). "Funnies: McCarthy's Language Barriers". ManUtd.com. अभिगमन तिथि 2009-06-12. ↑ "Good news for Barcelona as Messi gets his Spanish passport". The Star Online. 2005-05-28. अभिगमन तिथि 2009-05-29. ↑ Reuters (2005-09-28). "Ronaldinho scores the goals, Messi takes the plaudits". रीडिफ. अभिगमन तिथि 2006-08-23. ↑ "Frustrated Messi suffers another injury setback". ESPN Soccernet. 2006-04-26. अभिगमन तिथि 2006-07-22. ↑ Wallace, Sam (2006-05-18). "Arsenal 1 Barcelona 2: Barcelona crush heroic Arsenal in space of four brutal minutes". The Independent. अभिगमन तिथि 2009-06-03. ↑ "Barca retain Spanish league title". BBC Sport. 2006-05-03. अभिगमन तिथि 2009-06-03. ↑ "Lionel Messi at National Football Teams". National Football Teams. अभिगमन तिथि 2009-07-17. ↑ FCBarcelona.com (2006-11-14). Doctors happy with Messi op. प्रेस रिलीज़. http://www.fcbarcelona.com/eng/noticias/noticias/n06111404.shtml. अभिगमन तिथि: 2006-11-16. ↑ "Messi to miss FIFA Club World Cup". FIFA.com/Reuters. 2006-11-13. अभिगमन तिथि 2006-01-18. ↑ "Barcelona - Racing Santander". The Offside. 2008-01-19. अभिगमन तिथि 2009-05-30. ↑ Hayward, Ben (2007-03-11). "Magical Messi is Barcelona's hero". The Independent. अभिगमन तिथि 2009-05-30. ↑ "Inter beat AC, Messi headlines derby". FIFA. 2007-03-11. अभिगमन तिथि 2009-05-30. ↑ "Lionel Messi 2006/07 season statistics". ESPN Soccernet. अभिगमन तिथि 2009-06-03. ↑ अ आ Lowe, Sid (2007-04-20). "The greatest goal ever?". Daily Telegraph. अभिगमन तिथि 2009-07-07. ↑ "Messi dazzles as Barça reach Copa Final". ESPN Soccernet. 2007-04-18. ↑ "Can 'Messidona' beat Maradona?". द हिन्दू. 2007-07-14. ↑ Lowe, Sid (2007-04-20). "The greatest goal ever?". Daily Telegraph. अभिगमन तिथि 2007-05-07. ↑ अ आ Mitten, Andy (2007-06-10). "Hand of Messi saves Barcelona". Times Online. अभिगमन तिथि 2008-01-12. ↑ "Barcelona 3-0 Lyon: Messi orchestrates win". ESPN Soccernet. 2007-09-19. अभिगमन तिथि 2009-05-27. ↑ "Barcelona vs. Sevilla". Soccerway. 2007-09-22. अभिगमन तिथि 2009-05-29. ↑ Isaiah (2007-09-26). "Barcelona 4-1 Zaragoza". The Offside. अभिगमन तिथि 2009-05-27. ↑ FIFA (2008-02-27). "Xavi late show saves Barca". FIFA. अभिगमन तिथि 2009-05-27. ↑ "FIFPro World XI". FIFPro. अभिगमन तिथि 2009-05-30. ↑ Villalobos, Fran (2007-04-10). "El fútbol a sus pies" (स्पेनी में). MARCA. अभिगमन तिथि 2009-07-07. ↑ Fest, Leandro. "Si Messi sigue trabajando así, será como Maradona y Pelé" (स्पेनी में). Sport.es. अभिगमन तिथि 2009-07-07. ↑ "Totti le daría el Balón de Oro a Messi antes que a Kaká" (स्पेनी में). MARCA. 2007-11-29. अभिगमन तिथि 2009-07-07. ↑ "Barcelona's Lionel Messi sidelined with thigh injury". CBC.ca. 2008-03-05. अभिगमन तिथि 2009-06-14. ↑ Sica, Gregory (2008-08-04). "Messi Inherits Ronaldinho's No. 10 Shirt". Goal.com. अभिगमन तिथि 2009-06-02. ↑ "Late Messi brace nicks it". ESPN Soccernet. 2008-10-01. अभिगमन तिथि 2009-05-29. ↑ Osaghae, Efosa (2008-10-04). "Barcelona 6-1 Atletico Madrid". Bleacher Report. अभिगमन तिथि 2009-05-31. ↑ "Goal rush for Barcelona". ESPN Soccernet. 2008-10-04. अभिगमन तिथि 2009-05-31. ↑ "Messi magical, Real miserable". FIFA. 2008-11-29. अभिगमन तिथि 2009-06-02. ↑ "Barcelona 2-0 Real Madrid". BBC Sport. 2008-12-13. अभिगमन तिथि 2009-05-29. ↑ "Messi scores hat trick in Barca's 3–1 win over Atletico". Shanghai Daily. 2009-01-07. अभिगमन तिथि 2009-05-29. ↑ "Barcelona hit Malaga for six". अल जज़ीरा English. 2009-03-23. अभिगमन तिथि 2009-06-02. ↑ Logothetis, Paul (2009-04-09). "Barcelona returns to earth with league match". USA Today. अभिगमन तिथि 2009-07-07. ↑ "Messi leads Barcelona to 1-0 win over Getafe". Shanghai Daily. 2009-04-19. अभिगमन तिथि 2009-06-02. ↑ Lowe, Sid (2009-05-02). "Barcelona run riot at Real Madrid and put Chelsea on notice". द गार्डियन. अभिगमन तिथि 2009-05-31. ↑ Macdonald, Paul (2009-05-03). "Real Madrid Fan Poll Says Barcelona Loss Is Most Painful In Club History". Goal.com. अभिगमन तिथि 2009-05-31. ↑ Macdonald, Ewan (2009-05-02). "What Lionel Messi's T-Shirt At The Bernabeu Meant". Goal.com. अभिगमन तिथि 2009-06-02. ↑ "Barcelona defeat Athletic Bilbao to win Copa del Rey". Daily Telegraph. 2009-05-14. अभिगमन तिथि 2009-05-28. ↑ "Messi sweeps up goalscoring honours". uefa.com. 2009-05-27. अभिगमन तिथि 2009-06-04. ↑ "Messi recognised as Europe's finest". uefa.com. 2009-08-27. अभिगमन तिथि 2009-08-30. ↑ "Barcelona win treble in style". Gulf Daily News. 2009-05-28. अभिगमन तिथि 2009-05-28. ↑ "Barcelona eclipse dream team with historic treble". UK Eurosport. 2009-06-01. अभिगमन तिथि 2009-06-03. ↑ "'Messi es el mejor jugador que veré jamás'" (स्पेनी में). El Mundo Deportivo. 2009-08-29. अभिगमन तिथि 2009-08-29. ↑ "Leo Messi extends his stay at Barça". fcbarcelona.com. 2009-09-18. अभिगमन तिथि 2009-09-18. ↑ "Messi signs new deal at Barcelona". BBC Sport. 2009-09-18. अभिगमन तिथि 2009-09-18. ↑ "Messi and Ibrahimovic put Racing to the sword". ESPN Soccernet. 2009-09-22. अभिगमन तिथि 2009-09-23. ↑ Leong, KS (2009-09-29). "Barcelona 2-0 Dynamo Kiev: Messi & Pedro Unlock Stubborn Ukrainians". Goal.com. अभिगमन तिथि 2009-10-03. ↑ "Xavi: All is well at Barca". ESPN Soccernet. 2009-10-26. अभिगमन तिथि 2009-11-28. ↑ "Barcelona thrashes Zaragoza to go clear at top". CNN. 2009-10-25. अभिगमन तिथि 2009-11-28. ↑ "Guardiola expects more after win over Mallorca". ESPN Soccernet. 2009-11-09. अभिगमन तिथि 2009-11-28. ↑ "Barcelona forward Lionel Messi wins Ballon d'Or award". BBC Sport. 2009-12-01. अभिगमन तिथि 2009-12-01. ↑ "Messi wins prestigious Ballon d'Or award". ABC Sport. 2009-12-01. अभिगमन तिथि 2009-12-10. ↑ Barnett, Phil (2009-12-01). "Lionel Messi: A rare talent". The Independent. अभिगमन तिथि 2009-12-10. ↑ "Messi takes Ballon d'Or". ESPN Soccernet. 2009-12-01. अभिगमन तिथि 2009-12-10. ↑ "Messi seals number six". ESPN Soccernet. 2009-12-19. http://soccernet.espn.go.com/report?id=285375&cc=5739&league=FIFA.CWC. अभिगमन तिथि: 2009-12-21. ↑ "FC Barcelona's Messi wins World Player of the Year". ESPN Soccernet. 2009-12-21. अभिगमन तिथि 2009-12-22. ↑ "Tenerife 0-5 Barcelona: Messi Masterclass Sees Barca Back On Top". Goal.com. 2010-01-10. http://www.goal.com/en/news/12/spain/2010/01/10/1737345/tenerife-0-5-barcelona-messi-masterclass-sees-barca-back-on. अभिगमन तिथि: 2010-01-11. ↑ Bogunyà, Roger (2010-01-17). "Messi 101: el golejador centenari més jove" (ca में). fcbarcelona.cat. http://www.fcbarcelona.com/web/catala/noticies/futbol/temporada09-10/01/n100117108826.html. अभिगमन तिथि: 2010-01-17. ↑ "Lionel Messi Biography". Lionelmessi.com. अभिगमन तिथि 2009-07-07. ↑ "FIFA World Youth Championship Netherlands 2005". FIFA. अभिगमन तिथि 2009-07-07. ↑ Vickery, Tim (2005-08-22). "Messi handles 'new Maradona' tag". BBC Sport. अभिगमन तिथि 2009-07-07. 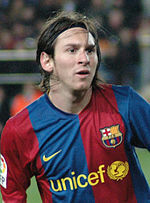 ↑ "Argentine striker Messi recalled for World Cup qualifier". People's Daily Online. 2005-08-20. अभिगमन तिथि 2009-07-07. ↑ "Messi tries again as Argentina face Paraguay". ESPN Soccernet. 2005-09-02. अभिगमन तिथि 2009-07-07. ↑ Homewood, Brian (2005-10-10). "Messi is a jewel says Argentina coach". रीडिफ. अभिगमन तिथि 2009-07-07. ↑ "Argentina 4-0 Venezuela: Messi the star turn". Allaboutfcbarcelona.com. 2009-03-28. अभिगमन तिथि 2009-07-07. ↑ Vickery, Tim (2006-06-05). "Messi comes of age". BBC Sport. अभिगमन तिथि 2009-07-07. ↑ "Argentina allay fears over Messi". BBC Sport. 2006-05-30. अभिगमन तिथि 2009-07-07. ↑ "Messi weiter auf der Bank" (जर्मन में). Kicker.de. 2006-06-13. अभिगमन तिथि 2009-07-07. ↑ "Argentina 6-0 Serbia & Montenegro". BBC Sport. 2006-06-16. अभिगमन तिथि 2009-07-07. ↑ "Holland 0-0 Argentina". BBC Sport. 2006-06-21. अभिगमन तिथि 2009-07-07. ↑ Walker, Michael (2006-06-26). "Rodríguez finds an answer but many questions still remain". द गार्डियन. अभिगमन तिथि 2009-07-07. ↑ "Argentina 2-1 Mexico (aet)". BBC Sport. 2006-06-24. अभिगमन तिथि 2009-07-07. ↑ "Germany 1-1 Argentina". BBC Sport. 2006-06-30. अभिगमन तिथि 2009-07-07. ↑ "Tevez Nets In Argentina Victory". BBC Sport. 2007-06-29. अभिगमन तिथि 2008-10-11. ↑ "Argentina into last eight of Copa". BBC Sport. 2007-07-03. अभिगमन तिथि 2008-10-11. ↑ "Argentina-Paraguay". Conmebol. 2007-07-05. अभिगमन तिथि 2009-05-28. ↑ "Argentina and Mexico reach semis". BBC Sport. 2007-07-09. अभिगमन तिथि 2008-10-11. ↑ "Messi's Magic Goal". BBC Sport. 2007-07-12. अभिगमन तिथि 2008-10-11. ↑ "Brazil victorious in Copa America". BBC Sport. 2007-07-16. अभिगमन तिथि 2009-05-28. ↑ "Lionel Messi out of Olympics after Barcelona win court appeal against Fifa". Daily Telegraph. 2008-08-06. अभिगमन तिथि 2009-05-27. ↑ अ आ "Barcelona give Messi Olympics thumbs-up". AFP. 2008-08-07. मूल से 2011-07-11 को पुरालेखित. अभिगमन तिथि 2009-05-27. ↑ "Messi sets up Brazil semi". FIFA. 2008-08-16. अभिगमन तिथि 2009-05-27. ↑ Baumgartner, Jesse (2008-08-19). "Argentina Takes Down Brazil 3-0". Examiner. अभिगमन तिथि 2009-05-27. ↑ Millward, Robert (2008-08-23). "Argentina beats Nigeria 1-0 for Olympic gold". USA Today. अभिगमन तिथि 2009-05-27. ↑ "Lionel me prometió venir a mi cumple de quince después del Mundial" (स्पेनी में). Gente Online. अभिगमन तिथि 2009-06-18. ↑ "Aún le mueve el tapete a Messi" (स्पेनी में). El Universal. 2008-06-19. अभिगमन तिथि 2009-06-18. ↑ "Luciana Salazar y Messi serían pareja" (स्पेनी में). Crónica Viva. 2008-06-19. मूल से 2009-06-08 को पुरालेखित. अभिगमन तिथि 2009-06-18. ↑ अ आ "Messi y Antonella pasean por el Carnaval de Sitges su noviazgo" (स्पेनी में). El Periódico de Catalunya. 2009-02-25. अभिगमन तिथि 2009-06-18. ↑ अ आ "Messi, a dicembre... sogni d'oro" (इतालवी में). Calcio Mercato News. 2009-04-21. अभिगमन तिथि 2009-07-13. ↑ "La verdad sobre la nueva novia de Messi" (स्पेनी में). Taringa. 2009-02-24. अभिगमन तिथि 2009-06-18. ↑ "Konami names Messi as face of PES 2009". Gamezine.co.uk. 2008-08-01. अभिगमन तिथि 2009-06-09. ↑ "PES Unites - Messi". PESunites.com. अभिगमन तिथि 2009-06-09. ↑ Orry, James (2009-06-23). "Torres signs for PES 2010". Videogamer.com. अभिगमन तिथि 2009-07-07. ↑ "Motions and Emotions in Barcelona". Konami. 2009-06-08. अभिगमन तिथि 2009-06-09. ↑ "E3 2009: PES 2010: Messi fronts exclusive E3 trailer". Konami. 2009-06-02. अभिगमन तिथि 2009-06-09. ↑ "MOTD magazine crew meet Messi in Barcelona". PESFan (Match of the Day Magazine). अभिगमन तिथि 2009-06-18. ↑ "Watch Zinedine Zidane and Lionel Messi in Adidas ad". द गार्डियन. 2009-05-27. अभिगमन तिथि 2009-08-16. ↑ "Maxi afirma que Messi deve vir ao Brasil para vê-lo jogar" (पुर्तगाली में). Último Segundo. 2007-08-20. अभिगमन तिथि 2009-11-03. ↑ मईer, Claudius (2009-10-20). "Hört mir auf mit Messi!" (जर्मन में). TZ Online. अभिगमन तिथि 2009-11-03. ↑ 101 "'Pichichi' y centenario" जाँचें |url= मान (मदद) (स्पेनी में). elmundodeportivo. अभिगमन तिथि 2010-01-17.